The first wave of four new NATO battalions has arrived at a military base in Eastern Europe close to Russia's border, with the alliance claiming it's driven to deter alleged 'Russian aggression' in the region. Several hundred soldiers from Germany arrived at the Rukla military base in Lithuania on Tuesday. Expected to be deployed just some 100 kilometers (62 miles) from the Russian border, the German troops are reported to be heading up the NATO force in the country, with Belgian, Dutch and French soldiers scheduled to join them later. 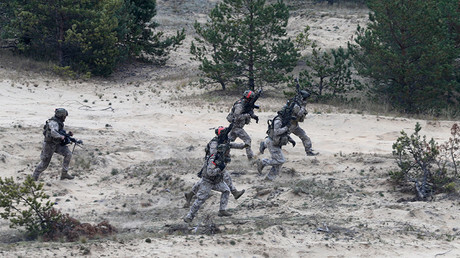 The battalion will reach its full strength of some 1,200 troops in the spring, AFP reported. Later this year, three other battalions led by Britain, Canada, and the US will also be deployed to Estonia, Latvia, and Poland respectively to beef up smaller rotating contingents of American troops in the region. There are no end dates for their stay, with the contingents said to be rotating every six months, according to Reuters. 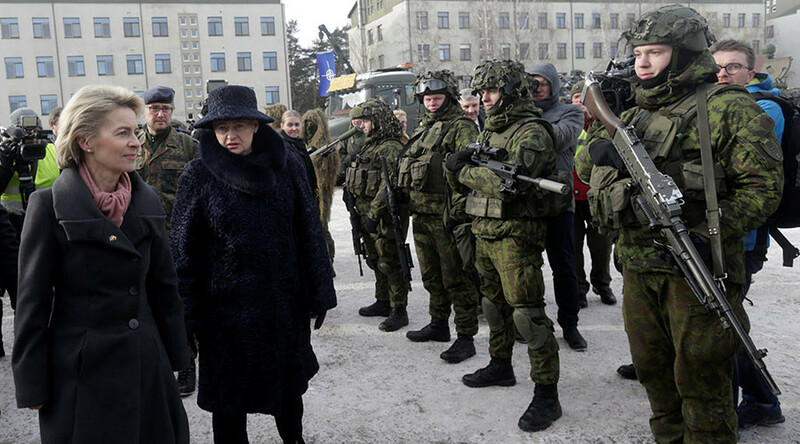 Speaking at the Rukla base, Lithuania's President Dalia Grybauskaite talked about "aggressive actions in our region," AFP reported. The move to expand NATO's presence in Eastern Europe – the highest levels since the Cold War – was agreed last year under the former Obama administration, who had accused Moscow of aggressive behavior. Russia has repeatedly denied the allegations, saying it's NATO's significant buildup in the region which undermines the security balance. Meanwhile, the new US President, Donald Trump said on Monday that the US strongly supports NATO, adding, however, that Washington wants all members to make their full contributions to the alliance. Trump has previously criticized NATO's role and the cost of its upkeep which he said is mostly borne by US while accusing other member countries of "not paying what they're supposed to be paying." Welcoming the German troops to the Lithuanian base, German Defense Minister Ursula von der Leyen said she no longer "doubted" Washington's commitment to the alliance, as quoted by Reuters. She referred to a recent telephone conversation with her American counterpart, James Mattis, and said, "after what we discussed, I have no doubt about his deep conviction in the importance of NATO and the commitment of the Americans within NATO to what we have agreed." The Pentagon chief is scheduled to have his first meeting with the German minister later this week, while the US president has agreed to meet other NATO member states' leaders in May.